US, 1945, 128 minutes, Black and white. Clark Gable, Greer Garson, Joan Blondell, Thomas Mitchell, Richard Haydn. 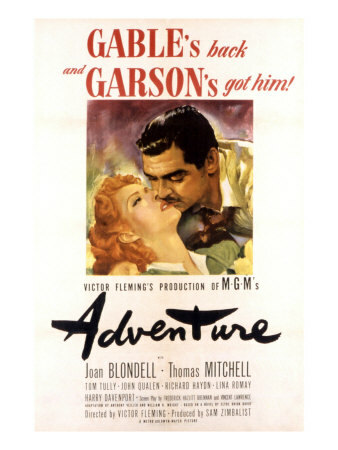 Adventure was Clark Gable's first film after his World War Two service. He relished the idea of playing a caddish hero who reforms. The advertisement was "Gable's back and Garson's got him!". The combination of Gable and Greer Garson is rather incongruous. Joan Blondell adds bright support as the good-hearted loud-mouthed friend of the heroine. Thomas Mitchell reprises his earnest drunk performance. All in all, the film is a curious M.G.M. production with emphases on comedy, action, war propaganda, comedy and moralising. It was directed by Victor Saville who directed such films as Gone With The Wind. The film is rather dated but is interesting as a curiosity item of M.G.M. in the '40s, and its place in the careers of its stars. 1. The film as a star vehicle? Gable as Hollywood hero and king? Greer Garson as proper Hollywood star and queen? How well did they work together? The supporting cast and their reputations? 2. The reputation of the film? A star vehicle after World War Two? Its popularity in its time? Now? M.G.M. production values: black and white photography, musical score? 3. The conventions of this kind of comedy adventure: the background of World War Two, the tough hero, the librarian reserved heroine, the religious overtones? The film as a piece of Americana? Battle of the sexes? Exploration of love and marriage ? in the tradition of the screwball comedies of the '30s? 4. Clark Gable as hero: on his ship, his collaboration with his men, action, being torpedoed, drifting in the ocean, discussions with Mudge? On the town in San Francisco? The visit to the library for Mudge? The raucous meal with Emily? The fights and Emily fighting? The clash with Emily? The visit to the house, the stealing of the chickens? The whirlwind visit to Reno and the marriage? The romance and his leaving? His harshness in action on his return to the Merchant Marines? The coming home, the discovery of the baby, the difficult birth. his prayer and the baby's coining to life? Credible Hollywood hero ? with the touch of reform and sanctity? 5. The war themes, action sequences? Mudge and Thomas Mitchell's hamming, the stereotypes of his character? Reform, prayer, fights? The visit to the library? The clash with Gable? His death and his promise of help? Sentimental presentation? 6. Emily and Greer Garson's reserve and style, work in the library, reaction to Gable, friendship with Helen, anger, the meal, the fight, her house and trying to sell it, the shopping, getting the chickens, succumbing to Gable's charm, the whirlwind enjoyment of Reno, the marriage, the end of the affair, her stubbornness, the birth and its difficulty, the happy ending? 7. Helen and Joan Blondell's raucous type? The good-hearted companion? The flirt? Reconciliation? 8. The comedy sequences and the tradition of the battle of the sexes? The comic touch of the stars? 9. The film as entertainment? Curiosity item?